In the novel, as in the film, SETI researcher Ellie Arroway detects a signal from the Vega system that contains the first 26 prime numbers. This is interpreted as a sign of intelligent life. She later finds another message containing blueprints for the construction of a large contraption (known as the “Machine”). The world’s nations cooperate to decode the blueprints and build the Machine, which they believe will allow humans to establish direct contact with the aliens from Vega. Contact provides perhaps the most believable depiction of first contact ever penned. Where Arthur C. Clarke’s Rendezvous with Rama focuses on the wonder of finding strange new worlds, Sagan focuses on what first contact would mean for humanity. Sagan explores the scientific, political, and even religious implications of contact. I was not surprised that Sagan – famous for his ability to communicate science to the general public – never shies away from the complex scientific issues involved in the story. Unlike so many science fiction authors, Sagan proves equally competent in his depictions of politics and religion. Sagan seldom relies upon tropes so common in science fiction. World leaders provide intelligent arguments about how to respond to the alien signal. The political machinations are subtle – the U.S. government worries about national security implications of the discovery, but never devolves into outright warmongering (the way the government of Mercury does in Rendezvous with Rama). It’s clear that Sagan has interacted with government officials in real life and understands the complexities of the policymaking process. I can imagine that some readers will find these debates less tedious, but I find the deliberateness refreshingly honest. The tension between science and faith becomes a central theme in the story, and again Sagan demonstrates his understanding of both perspectives. As the point of view character, Ellie begins as skeptical of religion, yet neither she nor the story are completely dismissive of faith. The contrast between preachers Billy Jo Rankin and Palmer Joss is particularly telling. Ellie dismisses the former as a blowhard, but is intrigued by the latter’s emphasis on trust and willingness to accept evidence. I’ve often complained that stories about Big Ideas™ sacrifice characterization. Sagan does not fall into this trap. Ellie Arroway is a fully realized individual with complex motivations. She is an intelligent person, yet she has human flaws (notably her sarcasm). *** SPOILER ALERT *** I was particularly moved by her reaction to the death of David Drumlin, her former graduate advisor and sometime rival in the scientific community. On the one hand, she feels guilty that Drumlin apparently died while trying to save her life during an accident. On the other hand, reflecting upon her relationship with Drumlin, she admits to herself that at times she had wished Drumlin dead. She cannot simply bring herself to mouth platitudes about the man. It’s one of the few times I’ve seen such a realistic dark side depicted in a protagonist. That said, unlike the movie, the romance between Ellie and Palmer Joss is not a central to the novel. There is some underlying sexual tension, but it’s not a focus of the story. One could be forgiven for forgetting about the character if not for the movie. Although I don’t think the novel needed a stronger romantic element, I do like how the film uses the romance to underscore the central themes of science and faith. This is not a criticism of the book so much as a comment on how “Hollywoodizing” the novel did not undermine story’s core themes. There is one part of the novel that I think the film changed for the better. *** SPOILER ALERT *** The Machine has seats for five people rather than just one. This means that Ellie is not alone when the Machine is activated. I found this to be a bit distracting. Ellie is obviously the novel’s focus and the other four characters receive only minimal development. Moreover, it’s more difficult to believe that Ellie simply imagined her experiences when she had four other witnesses. The book requires less of a leap of faith than the movie in believing Ellie. I worry that this reduces the power of Palmer Joss’ statement that he has faith in her. 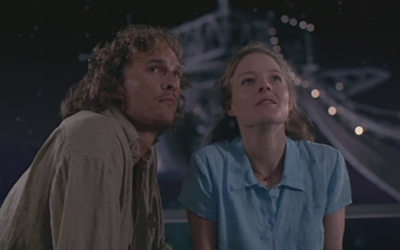 Overall, Contact – both the film and the novel – exemplifies intelligent science fiction at its best. Sagan explores Big Ideas™ but never sacrifices the characters. Sagan’s vision of first contact exhibits a remarkable level of verisimilitudeness in its depiction of science, politics, and religion. Fortunately, the novel and film provide different experiences, each excellent in their own ways. The movie is more streamlined in its exploration of its themes, but the novel benefits from the ability to explore those themes in depth. Didn’t realize the difference in the Machine’s passenger seating between the book and the movie. Excellent point…and discussion.